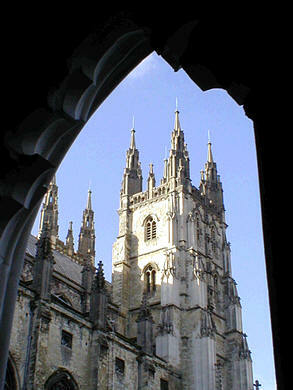 Bishops (senior members of the clergy) are based in churches called Cathedrals. (This word comes from the Latin “cathedra” which means the “bishops throne”). Only Roman Catholics, Orthodox Christians and Anglicans have cathedrals, as these are the only Christian groups that have bishops. Cathedrals are usually bigger and have more decorations than a church. Churches are not all the same. Churches of one denomination (group) may look different from those of another denomination. For example, a Free Church building will look very plain whilst an Orthodox Church building will often be highly decorated. However church buildings within the same denomination (group) can look very different from each other too. In the Church of England, some churches have a lot of decoration. These are called High Church or Anglo Catholic churches. Others, called Low Churches, are plainer. Some Christian groups do not meet in Churches. The Salvation Army worships in a building, called a Citadel. This is a simple hall. Outside there is usually a flagpole, on which the Salvation Army flag is flown. A flag will also be displayed inside the hall. The Salvation Army band sits at the front of the hall, before them is a reading desk. The Salvation Army officer [link to clergy below] stands at the reading desk to lead the worship. The worshippers sit facing the reading desk. Immediately facing the reading desk is a mercy seat or penitents’ form. This is a bench at which any worshipper can kneel if they wish to seek God’s help or forgiveness for something. An important feature of a Citadel is that there is no altar. The Salvation Army sometimes hold open-air meetings, so that others can see, hear and join in their worship. Usually, Free Church groups such as Baptists and Methodists worship in Chapels. Often these are simple rectangular buildings. 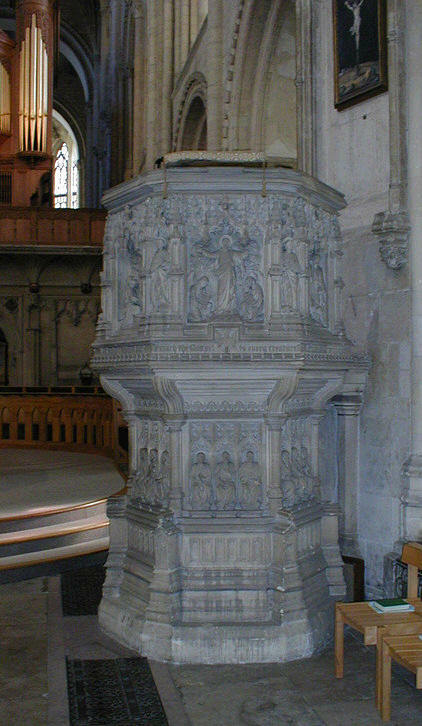 The most important feature of a chapel is usually the pulpit. This is because the sermon (made from the pulpit) is the most important part of Baptist and Methodist worship. Baptist and Methodist Chapels do not have an altar. They have a Communion Table at the front of the Church. The Church Elders or the elected Deacons sit behind it, facing the worshippers. In Baptist chapels there is a baptismal pool at the front of the Chapel. Most of the time it is covered and empty but it will be opened and filled with water for a baptism. The Society of Friends (Quakers) worship in a Meeting House. This is often a bare room with chairs grouped around a table. Some non-conformist groups e.g. the Pentecostals simply use their homes to worship. Orthodox churches are usually a square cross shape, with a dome in the centre. The dome represents heaven stretching over the Earth. Roman Catholic and Anglican churches are usually shaped like a cross – although some of the more modern ones are rectangular or round. Most Anglican churches have a tower or spire. This is built to help remind worshippers to look up to God. Most Orthodox, Roman Catholic and Anglican churches have bells. They are rung to call people to the service and at important moments during the service. Roman Catholic Churches often have a statue or cross outside. The cross is the main Christian symbol because Jesus’ death on the cross is central to Christian belief. This is a large bowl, often made of stone. It is used for baptism. It is usually near the church entrance but, in some modern churches, may be placed in the area in front of the altar, called the Sanctuary. Some churches, such as the Baptists and Pentecostals, have a large pool in the floor, instead of a font. They use this to baptise adults. The Altar is usually the most important feature of a church. This is because most of the sacraments are celebrated in front of it, including the most important – Holy Communion. A church may have more than one altar. The additional altars will often be at the side of the Nave (which is the central part of the Church.) 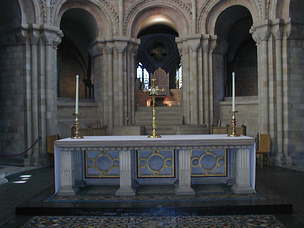 The main eastern (or central) altar is then called the High Altar. In front of the altar is an area called the Sanctuary, meaning “holy place.” This area and the altar are separated from the rest of the church. Usually this is done by means of a small barrier called an altar rail although, in the Orthodox Church, the barrier is a large screen. This screen is called an iconostasis. It is decorated with icons and has doors in the centre. These are called Royal Doors. The screen represents the separation between God and man. They doors are open, during a church service, but only the clergy may go through them to the altar. When the doors are open it is a sign that man can reach God. When closed they show that man can only reach God with the help of the clergy and the liturgy. This is a raised platform, usually enclosed, at the front of the church. The clergy stand in the pulpit to preach or to lead the worshippers in prayer. The Pulpit usually has a central position in the Baptist and Methodist Churches. This is because these churches are more concerned with hearing from and about the Bible than in celebrating the sacraments. The seating, in older churches, can take the form of long benches known as pews. Today ordinary chairs have replaced many of these. The seating faces the altar. An important feature of an Orthodox church is that it has no seats, except perhaps for some benches around the walls. Orthodox worshippers stand in the Nave (the central part of the church) during services. This is a reading stand or desk on which the Bible is placed. During a service selected people will stand at the lectern to read a passage from the Bible. In older churches the seating can take the form of long benches known as pews. Today ordinary chairs have replaced many of these. The seating faces the altar. An important feature of an Orthodox church is that it has no seats, except perhaps for some benches around the walls. Orthodox worshippers stand in the Nave during services. Many churches have stained glass windows, showing e.g. pictures of the saints or scenes from the Bible. The walls of some older churches may be painted with e.g. pictures of the saints or of heaven and hell. Orthodox Churches often have a painting of Christ the Pantocrator (or ruler) on the ceiling of the church. This reminds worshippers that he rules over heaven, represented by the ceiling, and Earth, represented by the floor of the church. Orthodox churches also have icons. These are pictures of Jesus, the Virgin Mary (the mother of Jesus) or saints. A saint is someone who lived such an exceptionally good life that he or she is considered to be holy.) These are usually painted on wood in bright colours and are stylised i.e. they are painted in a very similar way. Icons on either side of the Royal Doors show the incarnation (Jesus’ birth) and Jesus promised second coming. Almost all Christian Churches have a cross on a wall. A cross that has the figure of Christ on it is called a crucifix. (The only Protestant group, that uses the crucifix, is the Lutheran Church.) In the Orthodox Church the cross is often a cross-shaped icon. Roman Catholic Churches usually have statues of the saints. Every Roman Catholic church has a statue of the Virgin Mary. There will also often be statues or paintings of the “Stations of the Cross” in Roman Catholic Churches. These show the fourteen places where Jesus is said to have stopped on his way to his crucifixion. Some of the older Anglican Churches also have statues but most Protestant churches do not. All of these decorations helped worshippers to understand about Christianity in the days before most could read. Some like icons and statues also provide a focus for prayer. Worshippers will often light candles in front of them.